The past four years beginning with the deaths on hunger strike by Orlando Zapata Tamayo, followed by Wilman Villar Mendoza and now the specter arises that Marcelino Abreu will be added to this sad list brought into existence at a time of heightened repression in Cuba. Below Marc Masferrer lets us know of this man's stand. 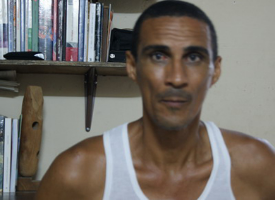 Marcelino Abreu is a Cuban political prisoner lying near death near in a Havana hospital. His protest is an act of free will, his own choice. He has proven he's willing to accept the consequences. But his death, if it comes within hours or days and because of his protest, will be the responsibility of the Castro regime. And then it lied to him when it the regime's agents told Abreu that if he ended his hunger strike, they would soon release him. When the promise was broke, Abreu resumed his protest. The regime last week transferred Abreu to a hospital in Havana, holding him isolation. Not only may that be an ominious indicator of his condition, it shows the dictatorship is willing to do whatever it takes to make sure Cuba and the world don't know what is happening to Marcelino Abreu. That is a brave man's name. We may not be able to save his life, but we can ensure that his death is noticed, that his killers know they will be held to account. We can do that by learning his name and telling his story. Fortunately, many around the world have taken to social media to tell Marcelino Abreu's story.